I made this Dora face cake for my 2 year old sister who is CRAZY about Dora. I made this one in 2010. The cake is just a vanilla sponge cake filled with chocolate ganache. I purchased 1kg of white fondant and colored it at home using Wilton gel colors. I downloaded a picture of Dora, enlarged her head and face using my scanner and printed the image. I cake out the image and place the picture on top of my rectangular sponge cake and cut around it to form the shape of Dora’s face. I then covered the cake in the skin tone fondant. I cut out Dora’s eyes, mouth and hair and used a Stanley knife to cut them out of the fondant. I stuck them on using an icing sugar and water mixture. I then outlined her features with black food gel and a thin paintbrush. This cake took a total of 6 hours to create, and it was well worth the effort after seeing the look on my sisters face. Thank you for taking the time to look at my cake and to read. 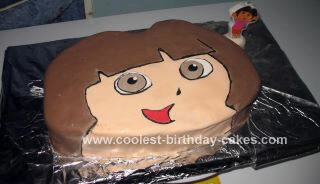 Birthday cake idea posted by Honey R.
This is awesome… best Dora face cake I’ve seen yet.